The fundamentals for gold and silver appear to be making a positive turn as the US, ECB and Bank of Japan simultaneously signals Worldwide QE3. The charts are just beginning to make new uptrends and may have much more room to go. One must remember both gold and silver have not made new inflation adjusted highs despite record sovereign debt levels and a coordinated worldwide currency debasement. There is much more room to go in this precious metals rally as many investors still need to unwind a record position in cash and treasuries. Over the summer a record number of retail investors held their largest cash position in many years. Now they must look for alternatives as the Central Banks are hoping to increase inflation to promote spending and investing, which will hopefully create employment. It is clear that policy makers are fighting for inflation as economic growth continues to stagnate not only in the U.S. but in Europe, Japan and even China. Meanwhile during this recent summer correction, governments around the world were buying gold and silver as a hedge against the U.S. dollar and the Euro which now appears to be crashing into new lows. Since the expiration of QE2, gold outperformed silver, the large producers and the small miners. However, that trend appears to be reversing as the cash strapped junior miners are getting more interest from the cash rich majors and royalty companies who need to look for resource growth. Notice the major royalty deals that Silver Wheaton just recently signed for the first time since 2007. The majors are hungry for growth and are sitting on large cash positions which is losing value as Central Banks print dollars. Too many dollars chasing dwindling supplies of precious metals may cause a major price spike. The majors must invest in the junior miners which in a bull market could provide great leverage and move exponentially higher in percentage terms than bullion. As we have believed for many months, governments around the world will be forced to print dollars to deal with a moribund economy while interest rates rise prompting investors to flee bonds into the undervalued precious metals and commodities. We saw capitulation in the mining stocks in late May when they pulled back to 2010 levels. Some junior miners are cheaper now at $1550 gold then when gold was $600 an ounce. 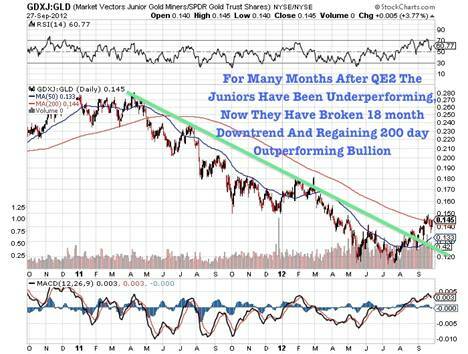 We informed our readers that a rotation will continue to occur from overbought equities and treasuries into the record oversold junior miners which could cause a major percentage gain over the next 12-18 months where technical conditions were so oversold that we could see snapback gains of possibly 200-400%. This happened before in the miners in 2008 and at other pivotal turning points such as in 2000 when the dot-com bubble burst and we believe it will happen again in 2013.